Is the FBI's recent demand that Apple Computer help them to unlock an iPhone used in an alleged terrorist attack a concern over national security, or a way to force Apple to create a "backdoor" key to unlock anyone's iPhone? John McAfee, the founder of McAfee security software, recently weighed in on this issue during an interview with CNBC. 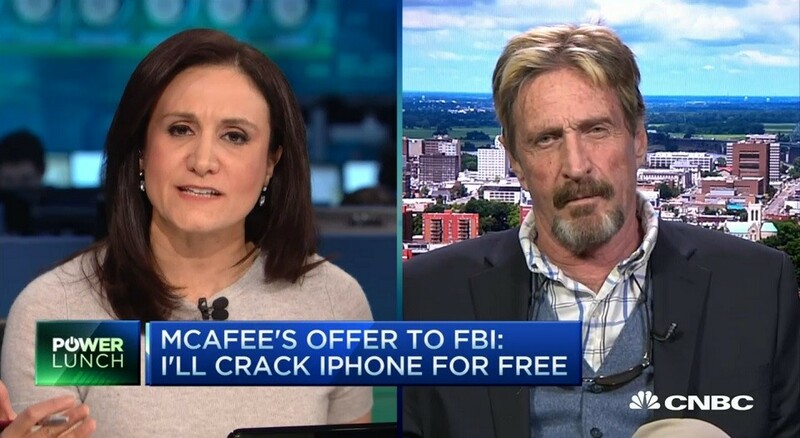 McAfee offered to unlock the iPhone for the FBI for free, eliminating the need for the FBI to force Apple Computers to give them access to their software to unlock the phone. If the FBI succeeds in getting a back-door encryption key, according to McAfee: "No matter how you slice this pie, if the government succeeds in getting this back door, it will eventually get a back door into all encryption, and our world, as we know it, is over. In spite of the FBI's claim that it would protect the back door, we all know that's impossible. This is a black day and the beginning of the end of the US as a world power." “I think that privacy is an innate right, and not just that, society cannot exist without it.” Privacy does not, has not and will not ever exist; it was simply an illusory notion used to peddle matter in the marketplace. Accept it and stop consuming the lie while they sit back and laugh...instead refuse to play - disengage and find freedom in The Truth.